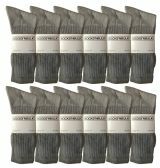 12 Units of Yacht & Smith Mens Wholesale Bulk Sports Crew, Athletic Case Pack Socks (King Size), by SOCKS'NBULK (12 Pairs Navy, Mens King Size 13-16 (Shoe Size 12-15)) - Big And Tall Mens Crew Socks at low wholesale prices. alltimetrading.com offers Big And Tall Mens Crew Socks at bulk discounted prices. Yacht & Smith by SOCKS'NBULK CREW SOCKS: Purchase wholesale bulk crew socks in various case packs. Lot sizes range from just 12 pair to 240 pairs. With everyday basic colors white, gray, black & navy. Bulk purchasing is great for organization buying, donations or even a large household. CREW SOCKS FOR Mens Kings: Sport crew socks are great for various activities and even casual wear. Whether your playing racquetball at the gym, running the race track, basketball yoga, These crew socks are great for all sports and even casual wear. Picture nice cotton chinos with cotton socks to go. Our available sizes cover all age groups and one-stop shop for basic every sock needs. WHOLESALE PRICING: Our prices are geared for the bulk buyer to buy an everyday needed item in bulk for cheap without risking quality. Whatever market you're making your purchase for commercial use personal use or donations. Yacht & Smith by SOCKS'NBULK branded socks are guaranteed to fit your project needs.